For those of you who are geeky about coffee like me, no big surprise, eh? Fruit-driven flavors come with less roasting, and as you roast to a higher degree (which is a literal term…a hotter finishing temperature…which also happens to give the bean darker appearance), the artifacts of the roasting process start to take over. Personally, i’m a fan of coffees roasted a bit lighter (but not full-on hipster-light) for non-espresso brewing methods, and just a bit on the heavier side (but not Italian/French roast) for Espresso machine. How about you? 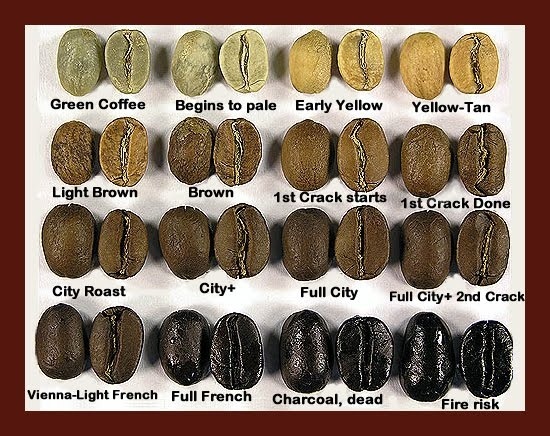 Does roast degree ever come into your coffee selection process? I like a dark roast espresso. One of my favorites is Starbucks Doppio Espressso. I realize that this puts me on the wrong side with many other coffee lovers. C’est la vie. 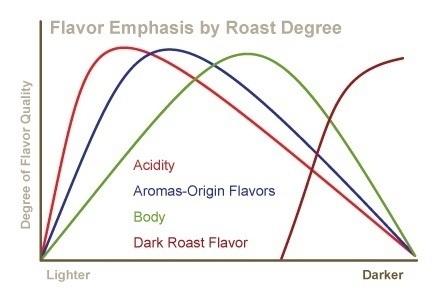 Does roast degree ever come into your coffee selection process? These are common terms in the industry to describe finish degree . Commercial coffees generally range from City to French. (each of these also corresponds to a general endpoint temperature range, which is what roasters actually look at to help dial in their consistency). the ‘h word’ coffee i mentioned earlier is more or less City Roast. City+ is generally where i enjoy brewed coffees, with my preferred espressos as Full City+ (or, a blend of diff roasts from City+ to Vienna, that average out as FC+). That said, medium dark Peet’s Major Dickason in 2 lbs. bags at Costco embodies true value (and we admit to liking hardware stores). Among the varietals if properly roasted, we will order Kona in high end restaurants, Bright/acidic/lightly roasted (and we know – we had a colleague whose family were Kona growers whose beans we’ve ground at home), though Kona’s far from our usual cups. Same could be said about Jamaica Blue Mountain when we had the real deal (too long ago for our taste), compared to the Blue Mountain “styles”. Back to Peet’s medium dark roast, Sulewesi always delivers. Ah, OK. then I’m not sure I’ve ever tasted a super-light/“hipster-light” roast. I suspect I wouldn’t love it, but I’ll keep an eye out for it. I know I don’t like very dark roasted coffee (except as espresso), but back when coffee-snobbery was a much more niche hobby than it’s become and European imports were still generally considered the ne plus ultra, I remember having Scandinavian (brands/imports) I liked very much, so I might surprise myself at the lighter end. And fwiw, it’s the Vienna-Light French that is my “ideal” roast for iced coffee which, somewhat surprisingly, I don’t see very often in Manhattan, but can and do buy at an upscale-ish fruit/deli/grocery store out in Sheepshead Bay (Brooklyn). Since the varietal isn’t identified, it’s presumably a blend of some sort - probably variable, but seems to be mixed to a reasonable degree of consistency. Won’t make that mistake again (before our colleague’s time with us) in Honolulu airport. My nephew has been roasting his coffee for about a year now . Ordering the beans from sweet Maria’s in Oakland. He uses a hot air popcorn maker to roast his beans . Only the old style works . Roasting about 4 oz. at a time . He says you will never by roasted beans from a store again . It’s time for me to make this leap . I’ve used the popcorn maker method before. I could never figure out why, but it worked super with some beans, yet not so great with other beans. Nowadays I drink mostly water decaffeinated coffee and that is extremely difficult to roast. I leave it to the professionals. @pushslice, if you are ever in Baltimore, look up Spro. (Disclaimer: I haven’t been in a couple years. I hope they are still at that level.) Back when I was younger, with more disposable income, and drank coffee regularly, I would stop by every chance I could get. Most of their offerings were custom roasted and then paired with a brewing method. Sometimes, the same bean would be roasted and/or brewed differently from the week before. At an average of $6 a cup, it wasn’t cheap, though. So, I like them all as long as they are brewed properly. For a naturally curious person, the hands on approach rly helps one correlate different roasting variables with what you experience in the cup. What do you suggest for a coffee roaster. Any particular model or type? Sounds like an interesting place. My kind of geeks! I enjoy doing a game with my friends when they come over, where I get my hands on two versions of green bean from the exact same farm; one goes thru washed process, the other a natural process. I roast them to the same degree. Then cup them side by side. Friends are shocked to learn (after they taste) that they only differ by processing method! 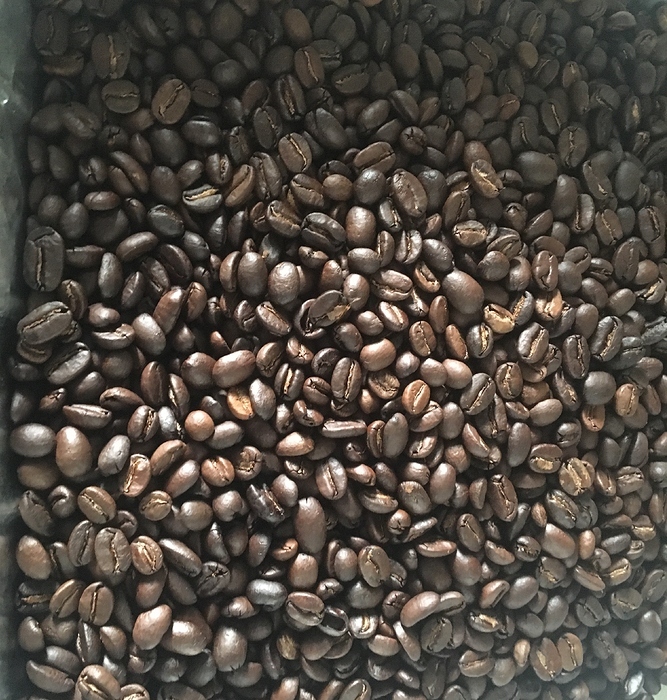 Typically they are convinced the washed bean must be a Kenyan vs the natural bean a South/East Asian; or that the washed bean must be a lighter roast than the other one. for something turnkey, others have had very good success with either the GeneCafe (air bed based, like a popper); or, the Behmor 1600 (this is drum based, mimicking how most commercial roasters are designed). I don’t have much repetitive experience with these to make further distinction, though. For my hobby stuff I built my own primary out of the guts of an air popper and adding some voltage control for the heat & fan; cheap , but fully manual. I have tried a few different brands at home and that of others using freshly roasted beans in a burr grinder. Two were from small local roasters and one was from intelligentsia. I can’t remember the various origins. One was a blend the others were single source. I would rather not drink coffee than what I tried. Sadly, The beans I bought went to compost. Looking at the graph it might be the acidity that bothers me but mostly it is the taste. Perhaps I don’t appreciate the origin flavors. Hints of tobacco and pencil shaving come to mind. Maybe it is because I drink it black. My husband who drinks it with cream and sugar found it drinkable but did not object to me composting the rest once we had some dark roast available. I like what I like and am pretty much used to being uncool . I might be open to trying a small cup at Stumptown next time I am near one just out of curiosity but I won’t waste any more money on beans. 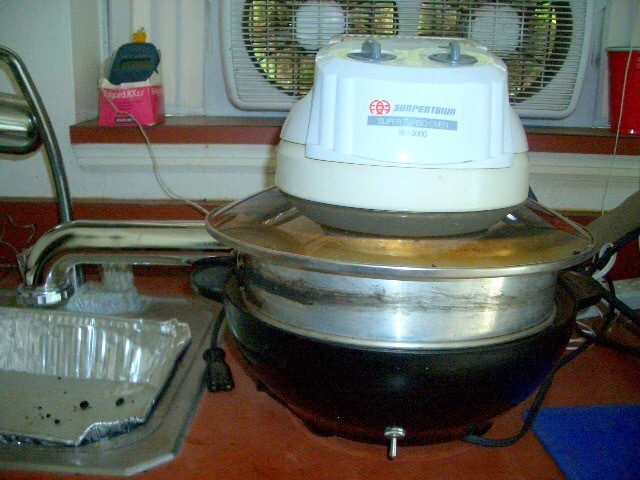 I have been using the SC/CO (Stir Crazy/Convection Oven) method for years. Decaf Timor is actually my favorite decaf coffee. I had a locally roasted source that went out of business a couple years ago.